I have received the very sad news of the death of Vi Taylor, a highly esteemed and valued member of Mungrisdale Writers Group. I had the great pleasure of working with Vi for many years before the foundation of the group. From the beginning her work was marked by her talent, sharp wit, amazing memory and storytelling abilities. She was a very fine writer who really deserved a much wider audience, bringing humour and a deep wisdom to all she wrote. 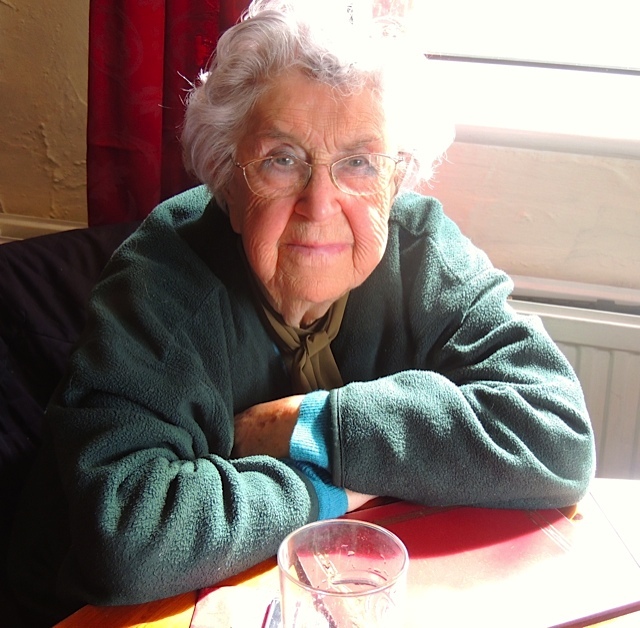 A founder member of Mungrisdale Writers, she was always an important influence, giving generous support over the years. Almost all of the group’s publications were enlivened by her wry, insightful and witty poetry and prose. I have many very happy memories of working with her – in 2000 she was part of the British/American Writers Retreat which I co-led on Iona, and was hugely popular with the group, even finding a distant cousin amongst the American contingent! She was a long-term visitor to Iona, where she drew deep inspiration for her own religious life. My Keswick group published Miracle 2000, an original and sideways look at the Nativity Story, and I vividly remember her coming into the studio at Radio Cumbria in Carlisle, and delivering her particular part with such brio and acting skills. The play was broadcast on Christmas Day, and proved hugely popular. Much more recently, Mungrisdale Writers’ iconic publication Dating at 60 and other Tribulations brought us to the attention of the national media, including Woman’s Hour and the World Service, and Vi’s work was broadcast on the airwaves across continents, leading to interviews and wide media interest! Until recent years she often appeared at Mungrisdale having fought her way up her lane in her car through ice and snow. Latterly, she had problems with eyesight and hearing, but it never dimmed in any way the fresh, sometimes acid, always humorous and wise contributions that she made in the group. Well into her hundreds, she left us all standing with her sparkling pieces. My lasting memory will be of an extraordinary artist and writer, whose rich heritage and imagination will be very sadly missed. It isn’t often that I have the chance to work with a woman of such talent, whose great-grandmother washed Wordsworth’s small clothes! Vi always used to say that you got to know someone very well if you did their laundry. I will feel her loss hugely in my group, and feel immensely privileged to have worked with her as a writer. I doubt we will ever see her like again, and she will be sorely missed by everyone. Angela Locke: Mungrisdale Writers’ tutor.